I bought some absolutely stunning glitter mixes from Charlie's Nail Art recently, one of them was Arabian Nights, this beautiful mix of fine and chunky, purple and gold glitters. 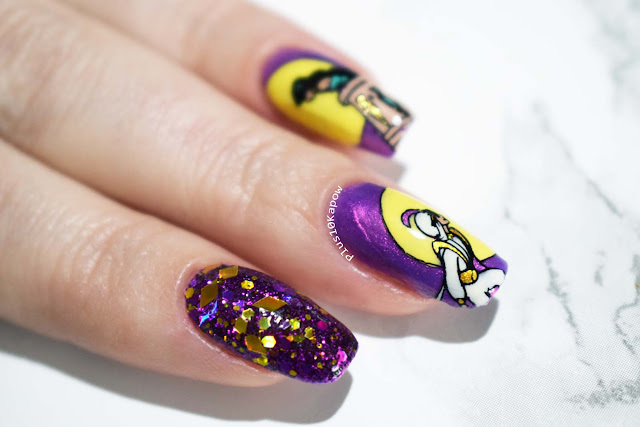 As soon as I saw the name, I knew what nail art to do with this one. 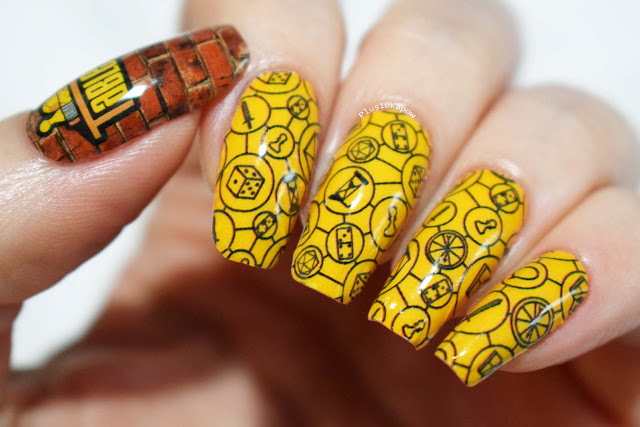 I have had the BBF 72 stamping plate for ages now and have only used it on a friends nails. So it was time to crack that baby out and get to it. 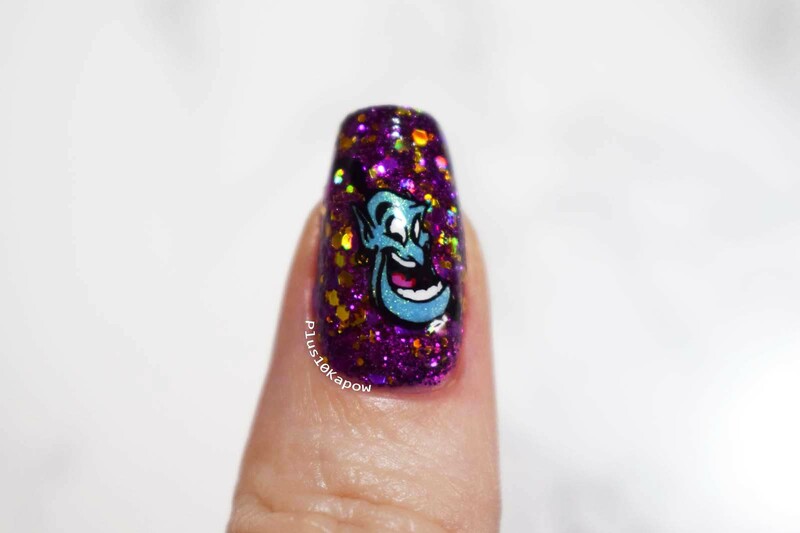 My favourite part of this movie is Genie! Robin Williams was so good in this role. As you can see, I haven't used this with gel or acrylic. 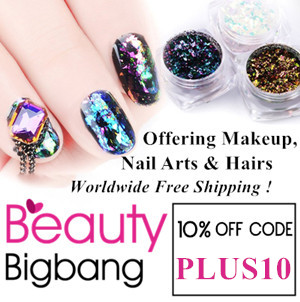 Although intended for those because they would encapsulate the chunky glitters, you can still get away with using regular polish. The glitter is topcoat thirsty though, I used two coats of Seche and some sneaky little glitters were still poking their pointy ends through and snagging on stuff, so another coat or two would have been ideal. To apply the glitter I just did a thin coat of Poundland Clear Polish (I used this for stamp decals, it's great) and then I dipped my nail into the glitter, making sure to press down. Then I pressed the glitters on my nail firmly to make sure they were stuck and went over it with a fan brush to remove any stragglers that weren't stuck and that's that! They are very sparkly too. You can find these glitters here for 75p for a 4g bag. 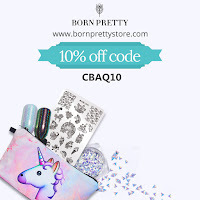 Use my code CLPK10 to get 10% off your Charlie's Nail Art order. 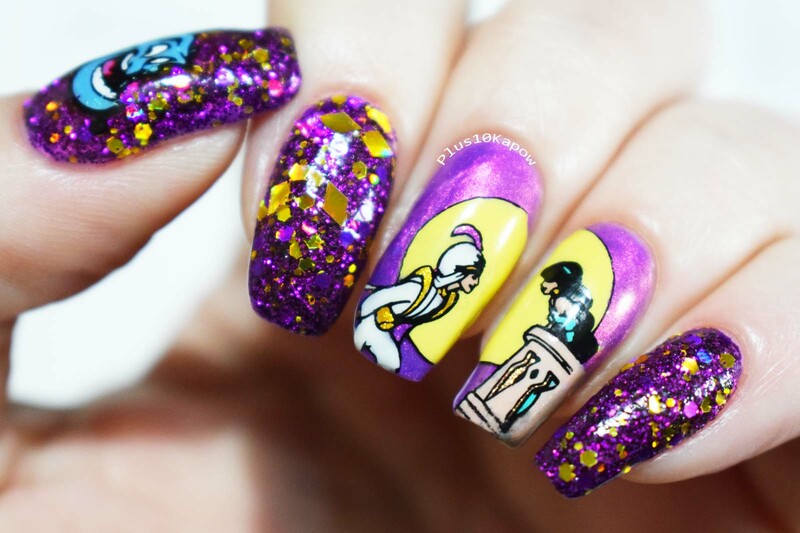 Which Disney film is your favourite? I love most of them but my favourite will always be Lilo and Stitch, although if I had to choose a Disney Princess film, it would be Beauty & the Beast or The Little Mermaid.